Mens Chef Pants. 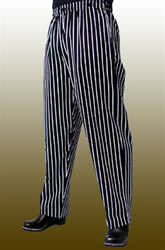 High Quality Chef Pants and Trousers made in America. 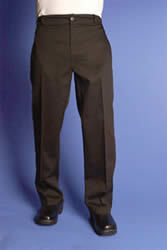 These sleek and stylish chef trousers are perfect for the executive chef. Created in the classic black color, they are made from the gloriously carefree line of fabric ~ Ultra PC 3000. The details in the styling will not only have you looking smart, but will allow you to work in comfort. The waist has a wide 2" elastic band built into the back half of the waistband, allowing you to move comfortably. There are five reinforced belt loops. The pants have a brass zipper front fly and an attractive logo button closure at the waist. The logo button is extra sturdy and made out of heavy duty brass. These chef pants have pockets galore! Each side has an extra deep pocket – perfect for those chefs always stuffing various items in their pockets! They have 2 pockets on the back, both in a patch pocket style, with buttoned flaps, to keep them closed and neat looking. The leg styling is straight legged, which is always professional looking. 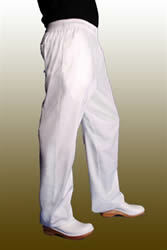 Even if you're not the top chef yet, these dress trousers help you look the part, and sometimes that's half the battle! The houndstooth pattern has always been associated with chefs clothing, and the styling on these executive chef pants makes the pattern look even better. 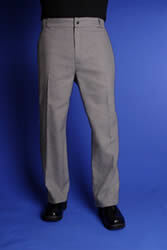 These trousers start with a fabric that is a perfect blend of cotton and polyester, and is yarn dyed. That means that the houndstooth pattern is created by the threads woven in the pattern, assuring you lasting color. Similar to the other executive chef pants, these feature 4 great pockets. Two are on the side seems and are extra deep ~ perfect for those who tend to stash things in their pockets. There are two back pockets as well, and these are the patch pocket style. The flaps on these pockets close with buttons. The waistband looks good enough from the front to wear these with or without a belt. The front closures are a heavy duty brass logo button and a secure brass fly. If you choose to wear a belt, the pants have five reinforced belt loops. The belt will also nicely hide the very comfortable 2" wide elastic panel sewn into the back of the waistband. So, you get comfort and class all at the same time. 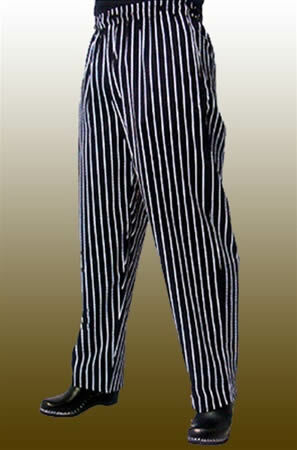 Black and white pinstripe pants go with everything! They look great with white jackets, black jackets, red coats, and even with pink coats for the ladies! When you demand great comfort and style, these chef pants should be your first choice. Made from the finest grade 100% natural cotton fibers, this fabric will breathe in the heat of the kitchen. The custom pinstripe pattern is printed with a reactive process, assuring you vibrant color through repeated washing. A slightly tapered leg and a loose fitting overall style allows these pants to look good on both men and women. The waistband is 2" wide and heavy duty. It also has a built in braided draw cord, allowing you to adjust the tightness of fit. The front fly zipper is an antique brass color. Once again, pockets abound! There are two extra deep side pockets and two patch pockets in the back. The garment has reinforced stitching throughout, providing you with the durability and quality you need in a great pair of chef pants. These are comfortable fitting pants are perfect for the professional baker, chef, or member of the kitchen staff. Done in classic white, these are made out of the remarkable Ultra PC 3000 fabric, This means that they are super easy to get clean and look great when you take them out of the dryer. The nice styling of these pants allows them to look equally good on men and women. They are loose fitting, and the legs are slightly tapered. The elastic waistband is heavy duty, 2” wide, and has a built in braided draw cord. The front of the pant has a zippered fly in antique brass coloring. These are also fitted out with two great extra deep side pockets and two back patch pockets. Chefs pants need to be able to move with you and hold up under enormous amounts of bending, stooping and reaching. These pants have reinforced safety stitching that allows you to do all you need to, and still look good doing it! Mens US 24"-26" 28"-30" 32"-34" 36"-38" 40"-42" 44"-46" 48"-50" 52"-54"
Inseam 30" 30" 32" 33" 34" 34" 34" 34"
* Love these chef pants but live outside the US? Contact us, tell us where you live and what you want to buy and we'll send you an exact shipping quote.